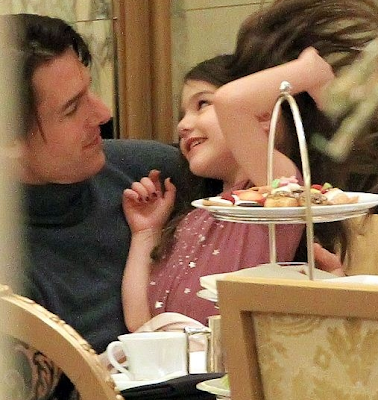 Suri, Katie & Tom left their NYC apartment and headed to Plaza Hotel on Monday, 20. 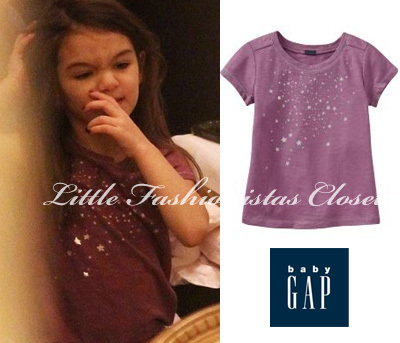 Suri is wearing Silver Star Print Top from Starry Night line by GAP and a flower-print skirt. 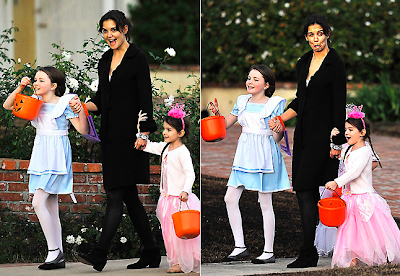 Suri is wearing Black Suede & Silver Mary Jane Shoes by Maloles Petite, which she first wore on December 13th 2010. Thanks to Kat from PopSugar TV for this video! Suri, Katie & Tom headed out for dinner to their favorite italian restaurant - Il Cantinori in NYC on Sunday, 19. 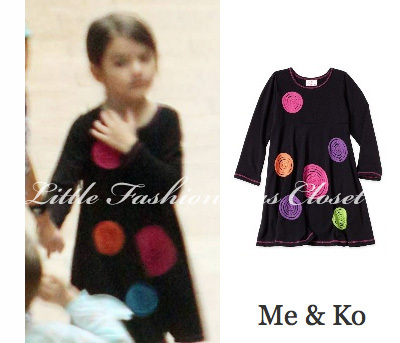 Suri is wearing Red Fleece Dress w/Leopard Bow by Matooka Kids Couture. Suri & Tom were spotted arriving at their apartment in NYC on Saturday, 18. Suri is wearing Silk Tshirt Dress in Lavender by Burberry, which she first wore yesterday. Suri, Katie & Tom pictured backstage after attending a production of George Balanchine's "The Nutcracker" at the David H. Koch Theater in New York City. Before the show, the trio flew in from Vancouver where Tom had been filming "Mission: Impossible - Ghost Protocol." Suri is wearing Silk Tshirt Dress in Lavender by Burberry. 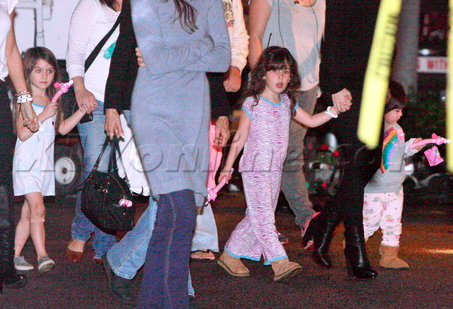 Suri was also wearing a pair of Pink UGG Boots. Suri & Katie observed the sites at Stanley Park on Thursday, 16 in Vancouver, Canada. The park was completely decked out for Christmas and the mother-daughter duo took a ride on the festive train that ran through the park. Suri even got to meet a Snowman and Santa Claus! After spending time at the park, Katie took Suri for a bite to eat at a burger joint. 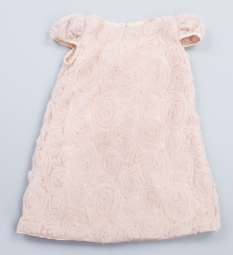 Suri is wearing Rose Print Silk Dress from Spring'10 line by Holmes&Yang, which she first wore on December 10th. 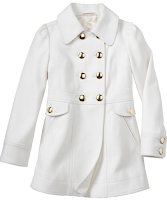 Double Breasted Coat in Ivory Frost from Admiral Club line by GAP. 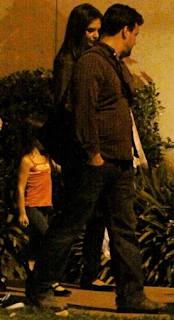 Suri visited Katie on the set of "Jack & Jill" filmed at The Grove in LA on Monday, 13. 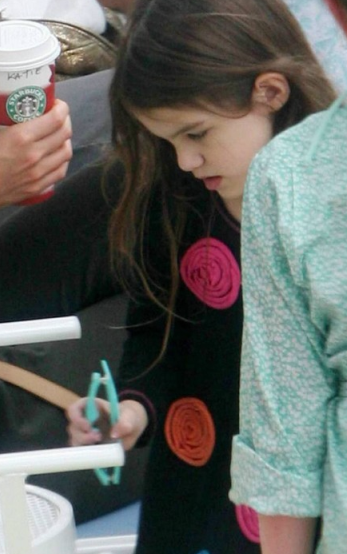 Suri is wearing Pink Gingerbread Print Blanket Sleeper from Sweet Ivy available at Nordstrom. in a Pink Satine Top from SS'10 collection by Luna Luna Copenhagen, which she first wore on July 2nd 2010. 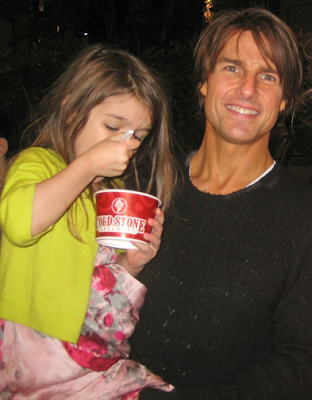 Suri & Tom went out to get an ice-scream at Cold stone in Downtown Burbank on Friday, 10. 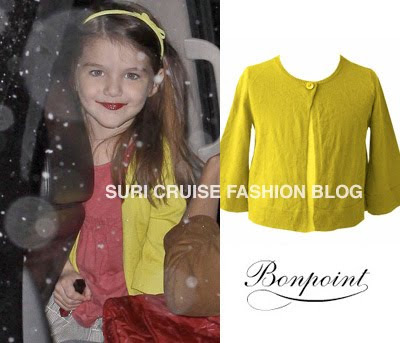 Suri is wearing Bright Yellow Cardigan from SS'10 Collection by Bonpoint, which she first wore on February 10th 2010. PopSugar TV put up a cute video counting down some of our favorite celebrity viral videos! Tom & Katie are included! 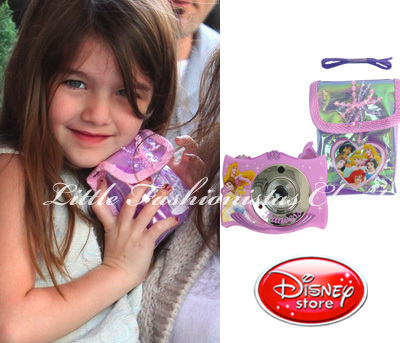 Suri is holding Disney Princess Talk 'n View Play Camera with Case. 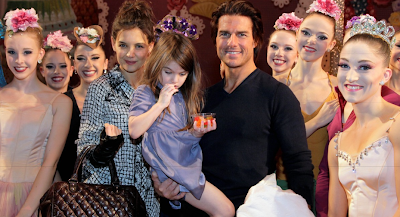 Suri Cruise wants to be a singer like her idol Willow Smith! Suri Cruise has shocked and worried her knackered mum Katie Holmes by asking when she can have her own music and movie career. Worried Katie, 31, has told friends she's terrified that Suri's growing up too fast. The four-year-old diva in the making, who counts Armani and Burberry as her favourite labels, has a whopping six wardrobes to house her clothes, which include a £1,300 D&G fur coat and a £1,800 pair of custom-made Louboutins, bought by Katie this summer. But after saying she wanted her own fashion collection, precocious Suri has now turned her attentions to her ‘big BFF', Will Smith's daughter Willow, and is desperate to have a singing career like hers. The Cruise and Smith families have been friends for years and since 10-year-old Willow signed with Jay-Z's Roc Nation record label this year and her debut single "Whip My Hair" reached No 11 in the US charts, insiders say Suri is growing impatient and is desperate to copy her idol. ‘Suri trails round after Willow whenever she sees her,' reveals a family friend. with this super ADORABLE Picture! Suri & KAtie stock up on fresh flowers at a wholesale market in Downtown LA on Wednesday, 24. She is also wearing the same shoes as yesterday - Disney Dazzle Silver Shoes by Stride Rite. 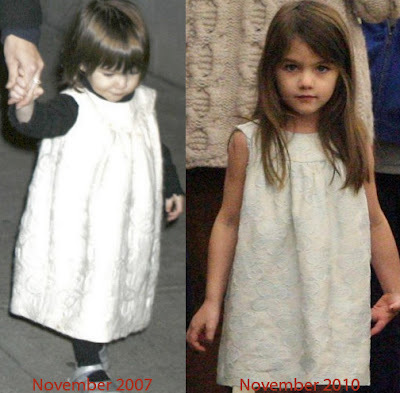 believe it or not, but Suri is wearing the same dress as she wore almost exactly 3 YEARS AGO! in November 2007! Fleur de lis dress in Vanilla by Mademoiselle à SoHo, available @ totsy! 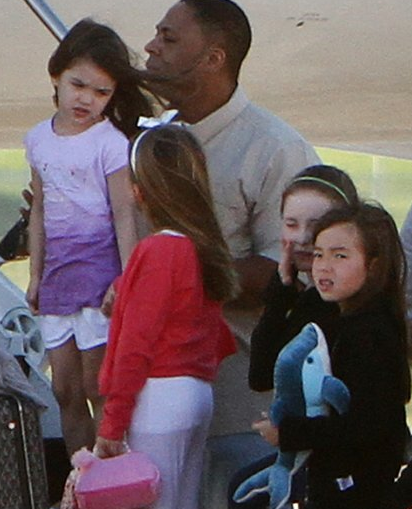 Suri & Katie took a flight on private jet from Fort Lauderdale, FL on Tuesday, 23.
ha! Suri shopped in the "Allure of The Seas" shop and got herself this Ombre Purple Dolphin Tshirt; Jeanne's Yang daughter is carrying the Plush Dolphin toy from "Allure of The Seas" shop. Suri is wearing Disney Dazzle Silver Shoes by Stride Rite. Thanks to Kat from PopSugar TV! Thanks to Anonymous for the hint! 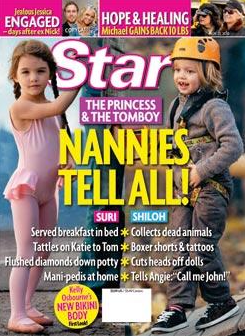 Suri & Shiloh: The Nannies Tell All! 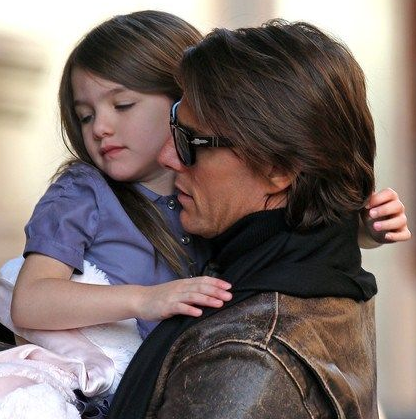 At just four years old, both Suri Cruise and Shiloh Jolie-Pitt are already living like Hollywood royalty. 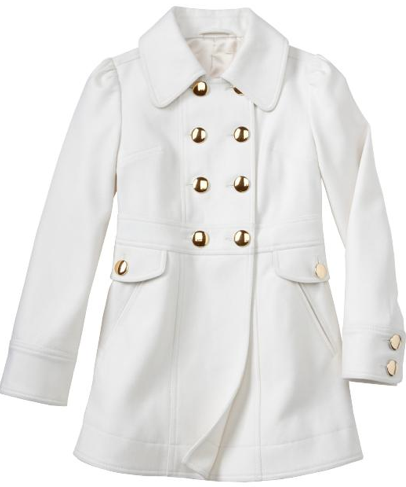 But for the little princess and the rough and tumble tomboy, life couldn't be more different! One plays with diamonds, the other, with dead animals. And who would know better about their polar opposite lives than the people who care for them? In the Nov. 29 issue of Star, on sale now, insiders from the Cruise and Brangie camps reveal the most intimate and shocking secrets of Suri and Shiloh's totally different lives. Tom Cruise and Katie Holmes' daughter Suri "never hears the word 'no,' from a nanny or anyone else," a source explains. Whether it's a priceless diamond tiara or cupcakes at midnight, spoiled Suri's wish is her overworked staff's command! But taking care of tomboy Shiloh, the daughter of Brad Pitt and Angelina Jolie, presents a different set of challenges. Though she's a sweet girl with a heart of gold, Shiloh has a serious mischievous streak that often gets the better of her. As we report in this week's issue, the wild child collects dead animals, plays childish pranks on unsuspecting nannies and cuts the heads of sister Zahara's dolls! "She was playing cowboys and Indians once and she said she had to scalp them," an insider reveals. "Brad made her apologize." 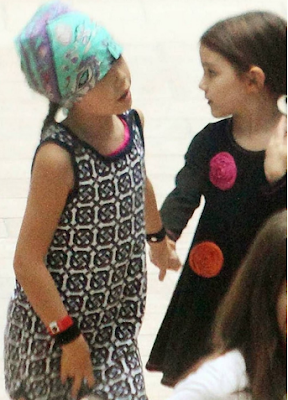 Suri & her friend were spotted holding hands on the set of Katie's new movie "Jack and Jill", several scenes are filmed aboard Royal Caribbean's ship "Allure of the Seas" on Sunday, 21. 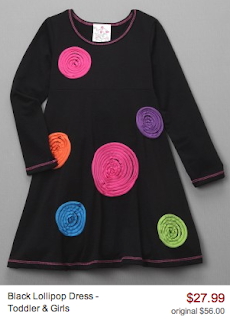 Suri is wearing Lollipop Black Swing Dress by Me & Ko. 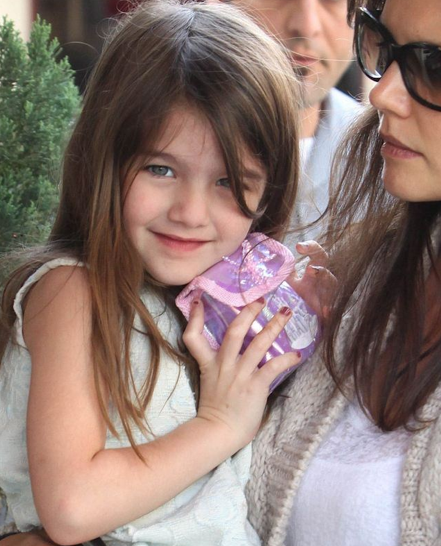 Suri is holding Turquoise Sunglasses from Kid Girl Spring'10 line by GAP. 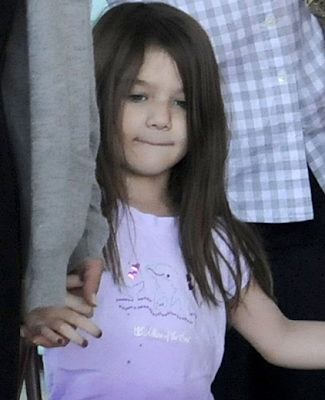 Suri is wearing Stripe Sole Glitter Flip Flops from Kid Girl Spring'10 line by GAP. on sale for only 18$ @ totsy! Suri was spotted carrying this doll on October 12th 2010. Thanks to Katrina for the id! earlier Suri also attended a dance class..
and did some last-minute costume shopping at the Century Mall. What a busy day for Suri and such lovely pictures! Thanks to Roberta for the link!